As you may have noticed, Are was recently in the United States "attending a conference". As soon as I relised this, I sent him an email asking him to pick me up an iPad. Why on earth, might you ask, would you want an oversized iPhone that can't even be used as a phone? Well, I say, because it is a piece of the future. I have no illusions about actually needing one, and I frankly think the limitations of the iOS to be pretty much insane (for example, you can't get a LaTeX compiler for the iPad. Why? Because TeX is a Turing complete language, and you're not allowed to just go ahead an execute code from the user. (Actually, as I googled this just now, it seems like they may have made some recent changes to allow TeX after all. At the moment, there is at least one app that allows you to set up a clever system of an iPad, a DropBox account and a computer, where you can edit the document on the iPad, have the computer automatically compile the document whenever there are changes, and then view the result on the iPad, so there is at least some jnterest. )), but it can't be denied that there is a certain amount of science fiction to it. So. I've been using the iPad for about 24 hours now, and my first impressions are that it is pretty cool, that it is surprisingly easy to type reasonably fast on it, and that it is sufficiently easy to use that I think my grandfather might be able to use it when a Norwegian version is available. I discussed this with my parents this weekend (before I got the iPad), and my father said it would have to be easier than sending a text. After trying it, I think it is. In any case, a more comprehensive review is coming at some later point. Are has also been using it for almost two weeks while traveling, and he has also promised to write a review. It should be interesting, as we are both probably what you would call an advanced user, but probably in quite different ways. And what is that? 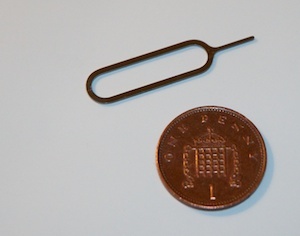 It's the sim removal tool that is shipped with every iPad and iPhone4. The neat thing about it is that it is made from a very fancy alloy called liquidmetal. I'll get back to that in a later article, but essentially it is an alloy which can be cast into pretty much any shape, but which will keep its strenght, unlike for example cast iron. Apple has supposedly made a deal with the inventors to use this alloy in mobile devices, and this little thing is the first test. Which means that this little piece of metal might actually be more a piece of the future than the iPad itself. Unless the blank space is some sort of deep commentary. I confess I am a little fascinated by the iPad. Mainly because I am going to make you put a "Don't Panic" sticker on it. But I am not sure I would actually find a use for one. Thankfully this means I get new shoes. I just had to use a real computer to fix the photo. But do you put a sim card in an iPad? Which you do, when you are not at home or at the office. A review will come eventually. I agree that it is surprisingly fast to type on, which made it very useful for me when I attended the conference - could take electronic notes without a warm laptop on my lap. I've also considered getting one for my Mom, but I reckoned she wouldn't use it enough to make it worthwhile..